Linda Collins | Greene County News Bath Township still has some salt leftover from the previous winter. BATH TOWNSHIP — As the Bath Township Road Department makes final preparations for several road construction projects in August, the township board of trustees is gearing up for Old Man Winter. During the July 18 township meeting, the board unanimously approved the purchase of 300 tons of rock salt from the Detroit Salt Company at $74.06 per ton, which adds up to a grand total of $22,218. Township Trustee Steve Ross pointed out that the township is facing a 53.3 percent increase in road salt prices for the 2018/2019 winter season as a rock salt shortage triggers a hike in salt prices throughout Ohio. “Last year, the township paid out $48.32 per ton. This is quite an increase,” Ross said. According to Bath Township Road Supervisor Mike Rhoades, the township already has approximately 300 tons of salt stored in the township’s salt storage bin, which was previously purchased at the 2017/2018 price rate. “We had a fairly decent winter last year, so we should be fine with 700 tons of salt for this coming winter,” said Rhoades. Each year, Bath Township participates in Southwest Ohio Purchasers for Government (SWOP4G) cooperative purchasing program, which has provided a substantial savings for the township, according to Ross. The new contract will run from Aug. 1, 2018 to July 31, 2019. Township Trustee Tom Pitstick noted that Beavercreek Township will also be paying $74.06 per ton for an estimated 1,500 tons of salt from the Detroit Salt Company. Both the City of Xenia and Xenia Township will be paying $74.09 per ton for 1,500 and 800 tons respectfully. The Village of Yellow Springs will be purchasing an estimated 320 tons of salt for $74.48 per ton. However, other municipalities in Greene County will be paying substantially higher premiums for their annual salt supplies. According to the SWOP4G’s 2018/2019 Rock Salt Final Bid Tabulation, the majority of Greene County government entities will be buying their annual supplies of rock salt from Compass Minerals America Inc. This includes the Greene County Engineer’s Office which will be paying $85.12 per ton for an estimated 7,500 tons of salt. 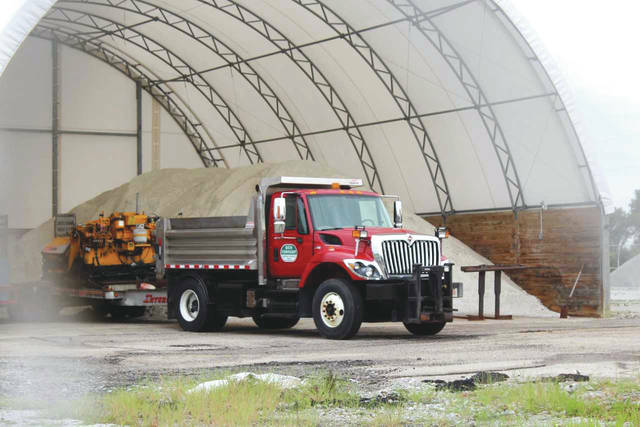 Sugarcreek Township will also be purchasing an estimated 1,000 tons of rock salt from the Kansas mineral company at $84.51 per ton, and the City of Beavercreek will be buying 10,000 tons of rock salt at $88.23 per ton. Alike Bath Township, Cedarville is also purchasing an estimated 300 tons of rock salt this year. However, the village will be paying $89.95 per ton of salt from Compass Minerals America or in other words, $4,767 more than the township for the same amount of salt. Among the 89 members of the consortium, Wright-Patterson Air Force Base will be paying the highest premium for rock salt this year at $103.03 per ton for an estimated 2,000 tons of rock salt from Compass Minerals America Inc. The City of Fairborn is not participating in the 2018/2019 SWOP4G’s Rock Salt Bid. https://www.fairborndailyherald.com/wp-content/uploads/sites/50/2018/07/web1_bathtwpsalt.jpgLinda Collins | Greene County News Bath Township still has some salt leftover from the previous winter.